So after he sends the text I am very curious as to what he meant. Was he saying he is crazy to be asking me out again? So I call and he spills his big idea. His idea is for us to change our facebook statuses and say that we are in a relationship with one another. I start cracking up because I think it's a great idea since everyone keeps calling us on everything we say and do. When I accepted the request the firestorm ensued. First no one believed but then after a few days they started thinking about it. Some did believe and said congrats. Now remember this is on my main page so ALL my family and friends could see this so I had some explaining to do to some people and tell them that it was a practical joke. Now what I wasn't expecting was his mother's opinion. Now let me briefly go back and tell you a back story. This guy is my brother n laws cousin, so people love to say that we are family even though we clearly are not. So when his mother saw it she immediately called him a vetoed me. She said she remembered me...when I was 8 and she has seen me around at some holiday parties. He didn't ask a reason why but I soon figured it out after talking to my sister. Turns out my sister and she do not have the greatest of family relationships. They both don't really say much to one another when they see one another, so therefore an opinion has been made. My sis even said no, but I told her he and I have nothing to do with their issues, that is if we decided to actually date. Therefore he made me undateable even though he keeps telling me how much he wants to. As for the other message, he asked me to his office Christmas party. Of course I accepted his invitation. After doing so the women around him started to look at him a bit differently. So there is a guy that I know. We are constantly harrassing one another. Day in and day out to the point where our friends will start things just to have us going back and forth like a married couple. So we decided to go out. Now it was and wasn't a date. He wanted to go to this restaurant because he wanted to know what food they hand before his Christmas party this past weekend. So he picked me up and we had dinner. Great conversation and our weird sense of humor made the evening fun. After dinner we went to local bar which has $1 shots. We tossed back a few, laughed at people and chit chatted. When he brought me home we sat in his car and talked for another 2+ hours. This dude even had the nerve to stroke my hair, almost making me fall asleep. Then he admired my hand. Actually is was a nice meeting. The next day he woke me up witht he text, "I'm about to do something crazy", "Can I take you out this weekend?" So I have been chatting up a few fellas lately. Unfortunately none of them spark anything. They are all nice and I will probably continue to talk and see them all. 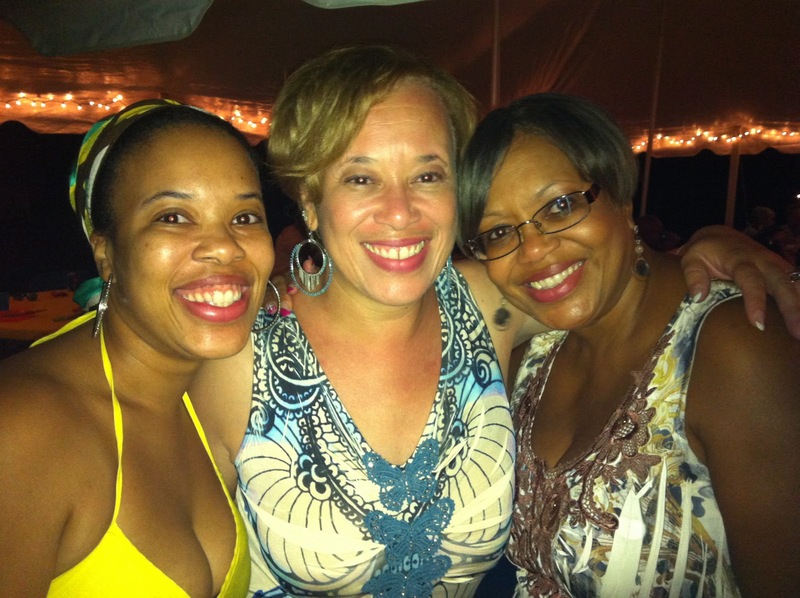 I decided to retire my yellow dress after this weekends antics at my sis birthday party. All I can say is it was boobtastic. I am thinking it isn't helping my cause for love except getting me attention and sometimes the attention that I do not like. Nothing like having a man twice your age talking to you all night. It's like, "Grandpa, isn't that your wife over there"? I guess that doesn't matter to them especially since that old ladies were shloshed. Then there were the teens. ho smiled and stared as their girlfriends pouted. "Oops my bad. Maybe you guys should go play video games". In all none of tha would have mattered because I would have ended up alone. Thank goodness I had an excuse to keep moving. Date coming up this weekend. I will keep you posted. This summer has not gone according to plan. I figured that I would be make it "Summer of Dating Part Deux", but have so far failed. I have only been out of one date and it was a failed one because it ended up being with someone that I actually knew and did not want to go on a date with. Damn friends and their I have a blind date and they are bringing a friend. The only prospect of a date I have right now is a guy named Will I met the other day. He wants to get to togther at the end of the week, so we shall we how this goes. I hate to be cynical but my eyes will not stop rolling. I talk to the guy for 5 hours on Sunday. He was really nice and had me laughing at his fear of raw meat. Lol he does not cook it. So when he offered up a dinner invitation I was all in. I have a lot more to tell but you will just have to stay tuned. I have been talking more often to the one that I should not be talking to and it's quite interesting. I have become a muse for him and his writings. Every few days he is posting some little fantasy he has worked in his head. Usually it is stemming from a conversation that we have recently had. I crack up reading them and shy away from making comments, but I frequently want to LOL. He even has made his friend on every social networking outlet that we are a part of. In fact I am currently chatting with his other readers and some of our mutual friends in a secret group that he created on Facebook. Isn't he special. Aside from fun conversation with him, I have been enjoying chit chatting with Officer. It seems we chat for about 20 hours out of the day, but never actually talk or see each other. It is kind of strange. I did however see him Tuesday, it was nice to see his face, after all it has been about 2 months. Then there is white boy. Don't really talk to him much anymore. We send sporadic messages to one another and that's about it. I am not really interested in seeing him again. He was nice but he just wasn't my cup of tea. Onward forward to find someone new. Ok so it's been a awhile, but I am here and dedicated to adding to this blog on the weekly basis. Anyhoo, so my weakness came home for Thanksgiving and came by to visit. And I will leave it at that.